As parents, you want the best for your child. Many parenting theories and ideas are on the web these days for us to peruse. Some fit our liking, our history and our experiences. Others are new and you may have questions about how they can fit into your everyday life. Attachment parenting is one parenting theory that has built an audience around it. Celebrities are doing it, so you may have seen it mentioned on TV or online. But there seems to be a conundrum when considering whether to take on attachment parenting and daycare at the same time. How could the two work together? We’ll explore that in this article. “Birth bonding.” This is starting off strong with cuddles and attunement right after birth, lasting days or even weeks. “Breastfeeding,” even if that extends to the toddler years. “Baby wearing” by keeping your baby attached at the hip, sometimes literally! Moms use slings, wraps or baby carriers to do this. In other words, leaving a kid in a playpen is the opposite of attachment parenting. “Bedding close to baby.” This is safely co-sleeping with your child. We wrote about this topic more extensively in our article here. “Belief in the language value of your baby’s cry.” This means using cries as a way of understanding what your baby is saying, and not ignoring them. The ‘cry it out’ method is discouraged with attachment parenting. It’s believed to create stress and thus affect your baby’s development. “Beware of baby trainers.” In other words, don’t put your baby on a strict schedule, and instead, just let life ‘flow.’ This also refers to an avoidance of sleep training. This list is not necessarily meant to be followed rigidly, as this article explains. It can be adapted to your needs and individual circumstances (such as if you have adopted a child, or if you were separated at birth for medical reasons, etc.). Is attachment parenting good or bad? However, of course, there are strong critics of attachment parenting, which you should be aware of. These include those who note other cultures that don’t do attachment parenting, but seem to produce perfectly fine humans. And, according to the Wikipedia article linked to above, some say you could be teaching your child the wrong lessons about life with attachment parenting. Or, opponents will say this upbringing may be more about the parent’s needs than the child’s. And so on. Attachment parenting and daycare: can the two work together? This is an interesting question. At first thought you may wonder: won’t this style of parenting induce stranger anxiety when my child goes to daycare? And, if they’re so attached to me, how will they socialize with others? How will they survive an entire day, or week, without mommy and daddy? Will they give me or the child care centre a hard time by being rebellious? We wrote about stranger anxiety and daycare in this article. So that may help to answer some of your questions, if you feel your child does have this issue. However, most proponents of attachment parenting will say that this style of continual bonding and coddling actually makes kids more self confident, and able to explore their surroundings without fear. In studies where researchers watched mommies leave the sight of their ‘attached’ child, the babies didn’t seem to cry. But the ‘unattached’ babies did (see the Psychologist World article linked to above). However, moms on the web have brought up this fear, and some do testify that the transition period to daycare is hard. This blogger mentions that, while difficult at first, the attachment parenting experience can help the child become attached to daycare and other caregivers in due time. Her other advice is to ease your child into daycare with part time attendance at first, so they get used to it. And, to let your daycare providers know about your child’s personality and needs in advance. Attachmentparenting.org addresses the ‘daycare question’ as well. They mention tips, and let you know what to expect (it takes some getting used to!). They also help you identify a good child care provider with this list of criteria. This includes finding a loving, caring atmosphere with a consistent provider. Should an attachment parent be guilty about seeking outside childcare? Are they hypocrites? The other thing the blogger above addresses is the issue of other people making you feel guilty for sending your child to daycare. This is a common criticism and frustration among ‘mom’ communities. It shows up in pop culture too, with movies, TV shows and commercials addressing it. 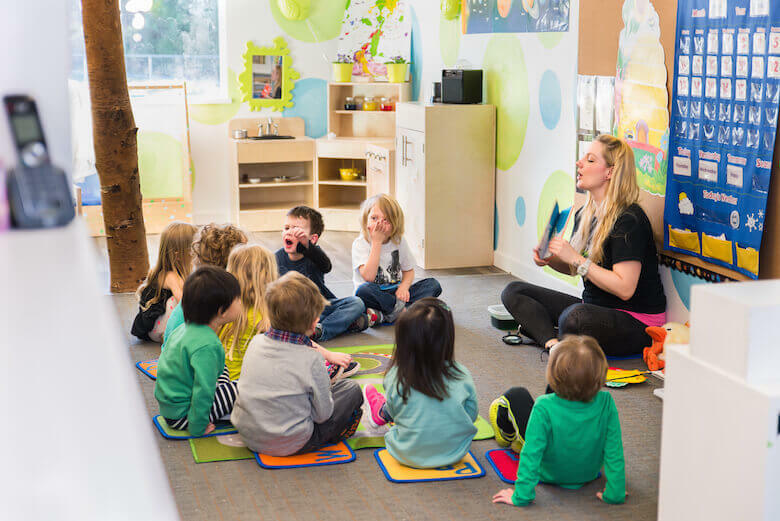 While we would be biased, as a daycare centre, to say you shouldn’t be guilty about being a working parent, we can say that a good daycare makes a difference. And also, as the blogger mentions, trust your instinct (after all, that’s what attachment parenting is all about). While attachment parents will find it hard to leave their kids in daycare, they don’t have to do it alone, or all at once. A good daycare centre will allow you to stay with your child as long as you need. They’ll also make sure your child feels included, and is cared for as an individual while you are away. This can help alleviate the fears you may have about combining attachment parenting and daycare.